Oh, for a muse of fire that would ascend The brightest heaven of invention! A kingdom for a stage, princes to act, And monarchs to behold the swelling scene! Then should the warlike Harry, like himself, Assume the port of Mars, and at his heels, Leashed in like hounds, should famine, sword, and fire Crouch for employment. But pardon, gentles all, The flat unraisèd spirits that hath dared On this unworthy scaffold to bring forth So great an object. Can this cockpit hold The vasty fields of France? Or may we cram Within this wooden O the very casques That did affright the air at Agincourt? O pardon, since a crookèd figure may Attest in little place a million, And let us, ciphers to this great account, On your imaginary forces work. Suppose within the girdle of these walls Are now confined two mighty monarchies Whose high uprearèd and abutting fronts The perilous narrow ocean parts asunder. Piece out our imperfections with your thoughts. Into a thousand parts divide one man, And make imaginary puissance. Think, when we talk of horses, that you see them Printing their proud hoofs i' th' receiving earth, For ’tis your thoughts that now must deck our kings, Carry them here and there, jumping o'er times, Turning th' accomplishment of many years Into an hour-glass; for the which supply, Admit me chorus to this history; Who, prologue-like, your humble patience pray Gently to hear, kindly to judge our play. I wish I had a goddess made out of fire to lead to me to the greatest heights of imagination! And that I had a kingdom to use as a stage, princes to act the play, and monarchs to watch the glorious show! Then the great fighter Henry would look like himself or rather like Mars, the god of war. Starvation, violence, and fire would follow him on leashes like dogs, waiting for his instructions. But forgive, gentlemen, the ordinary people who dare to act out such a great subject matter on this unworthy stage. Can this stage the size of a cockfighting ring hold the huge fields of France? Or can we stuff the helmets that terrified even the air itself at the Battle of Agincourt into this wooden O? Oh forgive us, since when you're writing you can abbreviate a million into a little squiggle. Let us, zeros in this huge bank account, work on your imagination. Pretend that there are two powerful monarchies shut into these walls, threatening violence to each other but separated by a dangerous, narrow ocean. Make up for what our version lacks by filling in the rest with your own thoughts. Pretend that one man stands for a thousand so that you have a whole imaginary army. When we talk about horses, pretend you see them stamping their proud hooves into the soft earth. Your minds have to dress our kings, carry them here and there, jump forward in time, and imagine that several years have passed within one hour. To help you, let me narrate this story. Like a prologue in a book, I ask you to hear our play patiently and judge it kindly. Doyle, Clio. "Henry V Translation." LitCharts. LitCharts LLC, 11 May 2014. Web. 20 Apr 2019. Doyle, Clio. "Henry V Translation." LitCharts LLC, May 11, 2014. 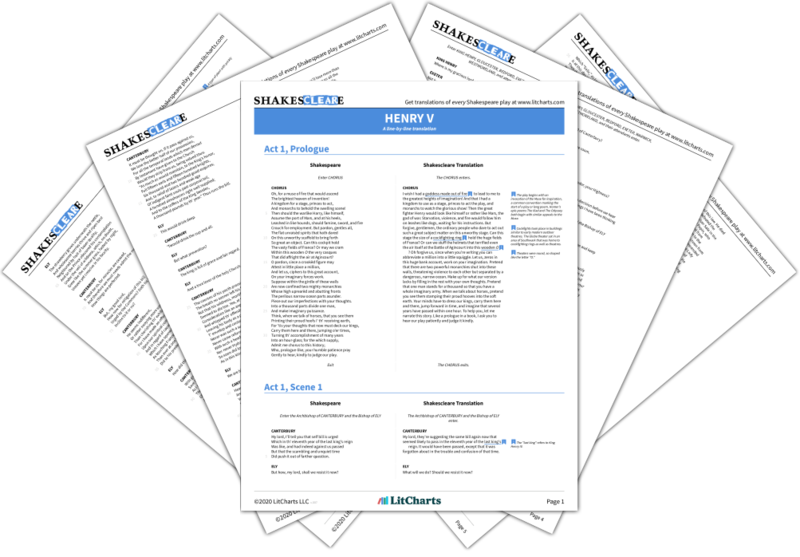 Retrieved April 20, 2019. https://www.litcharts.com/shakescleare/shakespeare-translations/henry-v.